It was on a cold dreary November day when I received a email from Can-Am’s Pierrick Pointet inviting us on behalf of their European and Middle East offices to attend the Liwa motor festival which takes place the first week of January. The festival brings together the region’s most powerful four-wheel drive trucks in the headline attraction event as they drag race up the Moreeb dune, which measures over 300 meters in height and has a 51-degree slope. The seven-day event also hosts a variety of other competitive events from car drifting, to flat course ATV and Side x Side drags and even competitive events with Camels and falcons. Aside from checking out the event, we’d also have the opportunity of meeting the crew from MTM Powersports and drive with some of the early adopters of the Maverick X3 in the legendary empty quarter of the Saudi Arabian desert which borders on the region of Liwa in the UAE. The famous American author Helen Keller once said, “Life is either a great adventure or nothing”. This has been a guiding principle I’ve always lived by and with that I was quick to accept the invite. Upon arriving on the outskirts of Liwa where the event is hosted you are amazed at the vastness of the desert and the size of the windswept dunes. In comparison to the Imperial Sand Dunes (Glamis), this place was a world all to its own and marked just the edge of what is the largest sand desert in the world. The event itself is wild, crazy and runs non-stop…or that’s at least how all the people in attendance see it. If I were paid a dollar for every time someone hit the rev limiter or backfired their exhaust I’d be a millionaire today. If it weren’t for Morning Prayer at the Mosque, you’d never hear a silent moment. If passion for motorsports would be measured by bored out cc displacement Liwa would mark the location of this motorsport haven. Can-Am and its distributor MTM Powersports knew this all to well and took advantage of the event to showcase the new Maverick X3 and to make a further impression on the market. From what we could tell, they were doing a good job. The concentration of X3’s at the event was really impressive. Rather than a group of riders being comprised of a mix of different side x side brands, riding groups in the Middle East are more like tribes. They each have a leader and group is predominantly driving the same brand. The first of the two groups we rode with is the notorious Boomer Team consisting of 12-14 members who were all former RZR XP Turbo owners. Beyond the purchase price of the vehicle, they’ve dropped an equal amount customizing their rides with every high-end performance mod you can think of. Full custom graphics, team clothing, and designated roles for each member such as, their own video and social media guy, make the fabric of the Boomer Team. In fact, the only difference between cars is choice of tires, along with the driver name and number on the door panels. Whether this is all for show or not is debatable, but like other brands Can-Am also has its Middle East ambassador. Known for his smooth riding style, Al Neyadi is a General in the UAE Army and has a following comprised of other military, police and emergency service group members. 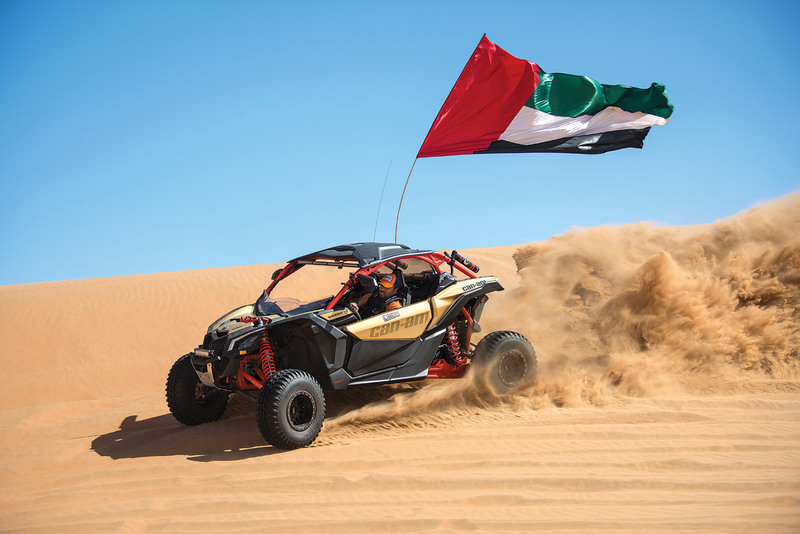 Aside from personal choice of tires, Al Neyadi runs a stock Xrs model marked with a huge national UAE flag mounted atop his Maverick X3 to display his proud heritage. Always with smile on his face, Al Neyadi graciously invited us to his camp for a traditional feast of Lamb that was prepared and served on two-and-half feet diameter silver platters accompanied by rice, Dahl bread and vegetables. Common between Al Neyadi, the Boomer Team and any other early adopter the aspect they were expecting from the new Maverick X3 was certainly more power, but have been amazed with the all new chassis design, handling performance and especially its durability. More than just coincidence the three defining characteristics Can-Am uses to position the Maverick are Defiant, Precise and Powerful, which perfectly compliment the traits all Emiratis strive to attain in their social structure. As worlds continue to collide you can be sure the Middle East market will have a growing influence on the design of high performance sport Side x Sides we’ve all come to love today.